All Dallas North Texas Comic Book Show and Convention Info Can Be Found Here! We Have All Your Event Tickets, Event Maps, Event Dates and Times. 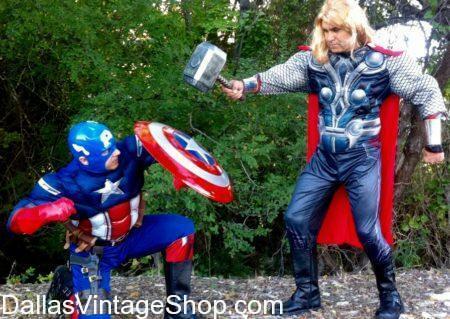 These Marvel Avengers Thor and Captain America Costumes are just a small sample of the Fantastic Couples and Group costumes we have Available! Come into Dallas Vintage Shop and Find an unbelievably large collect of Comic-Con Cosplay Contest from Marvel, DC Comics, Super Heroes, and Villians. Looking for just a few Accessories to finish a costume? We have Superior Quality Wigs, Makeup, Weapons, and Holsters!